Shopping for a new dishwasher can be an overwhelming experience. With so many brands that look almost identical in finish and size, along with varying features and wash cycles, how do you choose? Sticking to your purchasing budget, we recommend that you do your research to find out what features are available since new technologies are being introduced all the time that make dishwashing easier than ever before. In this comprehensive review, we are going to look at the range of GE dishwashers and their features so you can decide if this is a brand that fits your household needs. GE Appliances is now one of the largest appliance brands in the USA, that manufactures all sorts of household products such as refrigerators, ovens, freezers, air conditioners, washers, dryers, water heaters, and water filtration systems. Once owned by General Electric and now by Haier, the last 125 years has seen GE Appliances prove a legacy of innovation by designing appliances to modernize life for all their consumers. Each new product is made with the customer in mind, building on their experience to find new and innovative ways to improve. While the invention of the electric dishwasher is thanks to another brand, GE produced the first front-loading single-rack dishwasher in 1936 and the first automatic portable dishwasher in 1954. Over the following decades, GE’s research and innovation led to more firsts: The first ‘smart’ dishwasher in 1995, and the quietest dishwasher in America in 1999. Today, GE offers built-in top control, built-in front control, under the sink, and portable dishwashers across three brands: GE, GE Profile, and GE Café. GE vs. GE Profile vs. GE Café: What’s the difference? Under the GE, GE Profile, and GE Café brands, GE Appliances offer many options when it comes to dishwashers, catering to different budgets and feature preferences. We love the color choices offered by all GE brands from traditional white, black and stainless steel to slate, black slate, and black stainless steel. GE – GE branded dishwashers are reliable, essential, and cost-efficient, and are ideal for those that don’t need a lot of fancy features. GE Profile – At a higher price point with a little more flair than the GE brand, GE Profile dishwashers come with new technologies and extra features packed into a sleek and stylish design. GE Café – Ultra quiet with robust pro design and bonus features, GE Café dishwashers offer the best of the best with dishwasher models that are of restaurant quality. Visible Control Dishwashers – Generally cheaper than their counterparts, these classic dishwashers have easily accessible visible controls on the front of the machine. Hidden Control Dishwashers – With no visible displays or control buttons, there is no risk of pushing buttons by accident, which is particularly useful for those with young children. These dishwashers have a clean finish, and you can find the controls on the upper part of the front door. GE even copied a page from Bosch's playbook and produced an evergreen pocket handle version. Panel Ready Dishwashers – If you would like your dishwasher to blend in with the rest of your cabinetry, a panel ready dishwasher comes without a front panel so you can customize its look. There is no right or wrong when it comes to choosing a style of GE dishwasher, as it is up to your personal preference what works for you and what will suit your kitchen design. What Makes GE Dishwashers Special? Steam Prewash – This function is ideal if you have dishes or cookware with baked-on food that is hard to remove. A Steam Prewash before the actual washing cycle helps to soften these soils for easier cleaning on the Heavy, AutoSense, or Normal cycles. Piranha™ Hard Food Disposer with Removable Filter – Rather than sending large food particles down the drain, the Hard Food Disposer grinds food waste and eliminates drain blockages and the need to pre-rinse dishes. Bottle Jets – Water bottles, baby bottles, and champagne glasses do not always get adequately clean in the dishwasher, but with GE’s bottle jets placed in the upper racks, you’ll find that these items come out sparkly clean. Dedicated Silverware Jets – In some GE dishwashers, you’ll find silverware jets that spray pressurized water directly onto the silverware basket from the middle rotating washer arm. This means that your silverware comes out crystal clear. Deep Clean Silverware Jets – A step further than the Dedicated Silverware Jets, the Deep Clean Silverware Jets focus on your silverware from below the basket ensuring that all dried-on or sticky food is removed. Sanitization (NSF Certified) – Since bacteria can be commonly present in our kitchens, taking the right steps to eliminate it and keep your family safe from harm is vital. The SaniWash, Sanitize, or Anti-Bacteria function heats the water inside the dishwasher to around 155 degrees Fahrenheit to kill all bacteria, giving you peace of mind that your dishes are spotless and free of nasty bugs. Clean Sensor – This smart technology determines the right amount of water, time, and temperature needed to clean your dishes by sending a light beam through the wash water to measure its clarity. Heated Dry – With this rapid dry function, you can save around 8 minutes in the speed cycle and 30 minutes on regular cycles. What Else Do GE Dishwashers Have to Offer? Standard Washing Cycles - In all GE dishwashers, you’ll see 4 standard washing cycles including Auto Sense, Normal Wash, Light Wash, and Heavy Wash.
Rinse Aid with Indicator- Easily see if the rinse aid needs refilling. 3 Wash Levels – Dishes are cleaned equally throughout the machine due to washer arms in the bottom, middle and upper parts of the dishwasher. Wash Temp Boost – For heavier cleaning and drying. Electronic Tactile Buttons – Most GE dishwashers have these, while a few front control models have dial controls. As well as the standard features listed above across the GE range, you’ll notice that some models have premium features depending on the price range that they are in. Reversing Quad Blade Lower Wash Arm – With 4 blades and 25 water jets, this unique wash arm turns both clockwise and counterclockwise and sits in the lower part of the dishwasher. With jets dispersing water at different angles while it spins, all parts of your dishes will be sprayed to ensure a deeper clean. Quad Blade Middle Wash Arm – For better cleaning, rather than having two blades on the middle wash arm, there are now four. Side Jets – Dried-on food can sometimes be troublesome to remove, even on a heavy cycle. The side jets placed on the right and the left side of the tub above the silverware basket ensure that food soils are moistened while the dishwasher is filling. Third Rack – Silverware baskets can be a pain sometimes, so a third rack has been introduced into some models which allows you to put all your spoons, knives, and forks flat at the top, leaving extra space for your dishes in the bottom rack. Wi-Fi (GE Profile and GE Cafe only) – No longer do you have to go into the kitchen to check if a cycle has finished, as you can monitor its progress right from your smartphone. Amazon Alexa is also able to order more dishwasher detergent when you run out. Variable Pressure Jets – To ensure that all types of dishes with different kinds of soils are cleaned effectively, different water pressures are applied during the washing cycle. As well as these, you’ll find dedicated silverware jets and deep clean silverware jets as talked about above. Express – This 30-minute cycle is ideal for very light soils and is quicker than the light washing cycle. eWash – This environmentally friendly wash uses energy efficiency and less water for a short cycle time of just over an hour. Rinse – Instead of rinsing your dinner plates off under the faucet, place them in the dishwasher on the rinse cycle to get rid of excess food before you are ready to do a wash cycle. Fan Assist Dry – A fan pulls out the air and removes moisture from inside your dishwasher. Heated Dry – More heat is used for fast drying but using this function will mean that your wash cycle is about eight minutes longer. Power Dry – Instead of the heated dry function, some models use Power Dry, which has a different effect depending on the cycle it’s used with. When used with the Express wash, 15 minutes of drying time is added on to the cycle, and water evaporation occurs from an increased final rinse temperature. On the eWash cycle, drying time is 1.5 hours, and on other wash cycles, an additional dry time of 65 minutes is added as well as another 90 minutes for the fan to run. 4-Pass Multi-Wattage Wash & Dry Element – This allows for better heating coverage of the water during the cycle and ensures dishes are effectively dried. Floor Protect – The fear of your dishwasher flooding the kitchen can sometimes be in the back of your mind, but this feature is able to detect any leakage using the bottom pan. To make your life a whole lot easier when it comes to choosing a new dishwasher, we’ve made our call on which are the best GE models that money can buy today. Whether you have a small budget, are willing to stretch your pocket for a bit more luxury, or are somewhere in between, we’ve got you covered. 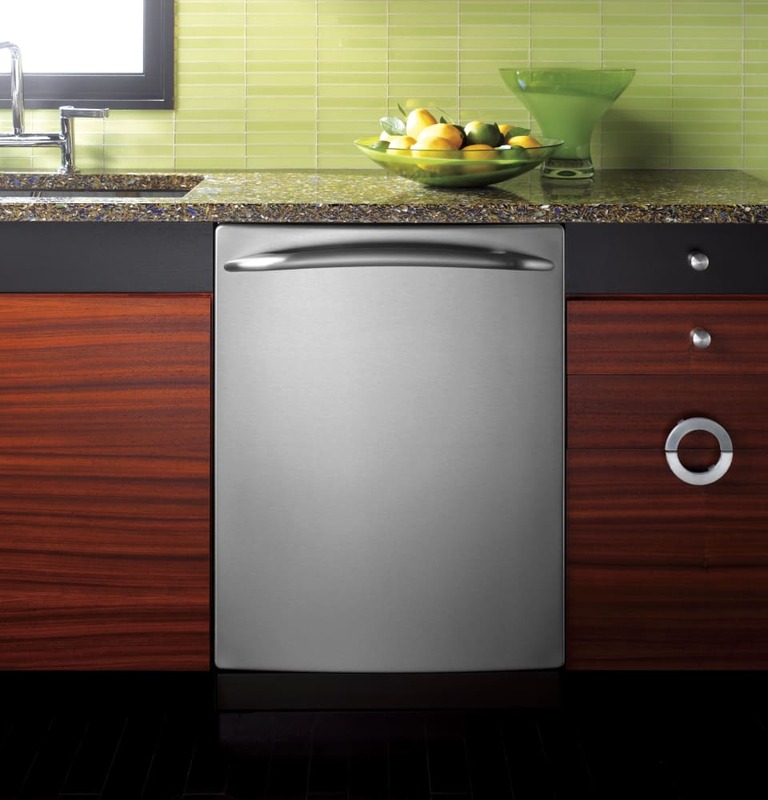 Read on for our top GE dishwasher picks. Buying a great dishwasher doesn’t have to cost the earth, especially when you don’t need a lot of fancy features. At around $450 (depending on seasonal promotions) the GDF610PSJSS is a 24-inch reliable and classically-designed model, with all the common GE dishwasher features and shared technologies at an excellent price point. It’s a built-in, front-control washer that comes in black, white, slate, or stainless steel so you can choose the right color that fits in with your other appliances. You’ll find silverware baskets with cell covers, a lower rack, and an adjustable upper rack with two bottle jets. The downside is that GDF610PSJSS is considered borderline of being loud at 51 decibels. One thing we do love about this model is that it has a regular wash cycle of 73 minutes which is shorter than most other dishwashers. The shorter time does not compromise on quality though, as dishes come out perfectly clean and completely dry, something that doesn’t always happen in this price range. If you have a bit more money to spend (under $799) and would like some modern additions as well as traditional specs in your dishwasher, the affordable GDT695SFLDS GE Profile Series could be just what you are looking for. At only 45 decibels, this dishwasher is super silent, so you’ll barely even realize that it’s on. This is one of GE’s most popular 24-inch built-in models, with hidden top controls and a thick handle, coming in multiple color options. As well as all the shared technologies of GE dishwashers, you get the Steam Prewash function, as well as the 4-Pass Multi-wattage Wash and Dry Element. The interior design features upper and lower nylon racks as well as a removable third rack for silverware. While the upper rack is height adjustable, the bottom rack has multi-position fold-down-tines so you can customize the layout depending on what dishes you need to wash. The dedicated silverware jets ensure that your cutlery in the 3-piece basket gets nice and clean each and every time. Delving into the mid-range price bracket (under $900) we have the GE Profile PDT825SSJSS, which is another super silent 24-inch model with a stainless-steel tub. It has smoothly moving racks, with the upper adjustable rack featuring a mix of fixed tines, fold down tines, steam safe shelves, and ball-tip tines. As well as all the shared technologies and features of the GDT695, you get the Quad Blade Middle Wash Arm and a Reversing Quad Blade Lower Wash Arm. What really sets this model apart from the cheaper models is the boosted washing system, now with 140 spray jets for an even better clean. Out of all the fantastic dishwashers from this brand, our number one choice is the GE Café CDT835SSJSS. While it may have the same technologies and overall features of the PDT825 listed above, the stunning stainless-steel design with large tubular special handle makes it a delight to have in your kitchen. As you’d probably expect from the higher price point (on or around $1,000 depending on promotions), some extra features have been added into this model such as a rinse cycle and 5 washing cycles instead of 4, which are ideal for busy households with different kitchen needs. If you have the extra money to spend, then this is a dishwasher that is going to last the distance and keep all your dishes and cookware sparkling clean for many years to come. To round up our favorite GE models, The GE Profile PDT855SSJSS) is a premium feature dishwasher that you can not only pick from stainless steel, black, or black stainless steel, but you can also choose a panel ready model to customize for your kitchen. This is a superb option for those that want to have all their cabinetry and appliances streamlined, as your dishwasher disappears when closed. Along with being super-silent at only 40 decibels, you’ll get all the wonderful features that you can find in the GE Profile GDT695 and GE Cafe CTD835 dishwashers, along with the addition of Wi-Fi, a removable third rack, and additional wash cycles. The PDT855 really is the crème de la crème of the pack, and incredibly worth it (or around $1,200) if you are looking for a dishwasher with all the bells and whistles you could ever need. Which GE Dishwasher Will You Choose? As you can see from our comprehensive guide to GE dishwashers, this brand has a large variety of products to choose from. While we have given you our top picks for budget and luxury dishwashers, you can further research the entire line up on the following page. All in all, GE catalog includes many sub-standard models with well over 50 dB noise level and outdated looks. Once you pass these products (which range in price from approximately $300 to $450), you will get more handsome dishwashers with up-to-date technologies and respectable quietness and wash capabilities. Especially, GE Profile and GE Cafe line-ups complete the look of any kitchen package and offer one of the best clean in the industry. Here at Designer Appliances, we know all about how to find the right appliance for your home and can carefully guide you through the selection process. Please feel free to contact us to discuss your requirements or drop in and see us at our showroom where one of our friendly sales staff will happily walk you through your options.